Summer 2017 Graduation will be Saturday, August 5 at 10 a.m for both graduate and undergraduate candidates. The ceremony will take place in the Rosemary and Harry Crisp II Arena which is located in the Vera Low Center for Student Enrichment at 101 Wildcat Lane. This entry was posted in News and Information on July 31, 2017 by Terri Merrill. It’s Bethel’s birthday – And our Essay Contest is one more reason to celebrate! Think about what Bethel University means to you, and how it has changed your life. Email you essay submission to PR Director Cindy Chambers at chambersc@bethelu.edu by April 14, 2017. The best essay overall will win a $175 VISA giftcard! The winner will be announced at the upcoming Bethel Birthday Bash at your local campus. CLICK HERE to RSVP for a Bethel Birthday Bash near you. This entry was posted in News and Information on April 7, 2017 by Terri Merrill. Like so many Bethel alums, Barry Michael planned to graduate from college on a “typical” timeline. In fact, after finishing high school in 1979, the Jackson native went straight on to Memphis State University. But a year-and-a-half into his traditional college experience, he decided to apply for a job at the Jackson Police Department, and was hired. That’s when Barry dropped out of college to devote his life to law enforcement. It might be typical to say he “never looked back” as he rose through the ranks, ultimately earning the title of Deputy Chief of Police. But that wasn’t the case with Barry. Ray told him that Bethel was starting its very first group of online Criminal Justice students. The new online format, he said, would allow Barry to juggle his personal, professional, and academic responsibilities. Ray’s enthusiasm was contagious. Barry enrolled. And just 17 months later, in December of 2011, Barry graduated with that first cohort group. This entry was posted in News and Information on April 6, 2017 by Terri Merrill. At 52 years of age, Walter “Bubba” Mullen was a bit older than most of his MBA classmates. A bit older – but even more eager to learn, grow, and challenge himself. Mullen, who now serves as Vice President and Chief Information Officer for Alfa Vision Insurance, was heading up the two largest global Information Systems projects at Nissan North America when he first heard about Bethel in early 2013. Despite his unrelenting responsibilities and years away from school, he made up his mind to tackle the MBA program. Just 18 months later, he earned his graduate degree. This entry was posted in News and Information on March 2, 2017 by Terri Merrill. I had been a Paramedic and in a middle-management role for several years and wanted to move up, but the requirements for promotion always seemed to be just out of reach. They increased from an associate degree (which I had) to a bachelor’s, which I did not have. Despite continuing to take college classes here and there, it seemed I wouldn’t reach my goal in my timeline. I couldn’t see the end. This entry was posted in News and Information on February 16, 2017 by Terri Merrill. I was in the first Nashville cohort class Bethel (then College) had in Nashville. Before Palmer Plaza, we met weekly at a hotel on Music Row. I graduated May 2, 2004, with a BS degree in Organizational Management. I’ve worked for the Nashville Sheriff’s Office for over 25 years and I am currently the Director of the Security Services Division. For the past 15 years, I’ve been assigned to the FBI’s Violent Crime/Gang Task Force out of the Nashville Resident Agency. In December 2012, I graduated with the 251st Session of the FBI National Academy. In 2014, my partner and I were peer-nominated and selected as Tennessee’s Top Cops by the National Association of Police Organizations. We were recognized Nationally as two of America’s Top Cops, and presented that award in Washington DC. In 2015, I was twice given the United States Attorney’s Office Award for Excellence in Law Enforcement. My Bethel degree helped me move up through the ranks at the Nashville Sheriff’s Office and was instrumental in obtaining a command level position. Additionally, the friendships I made during my time at Bethel have carried through to this day. 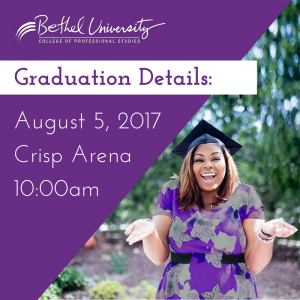 I have convinced several of my coworkers of the importance of completing their degree at Bethel University and many have done just that. This entry was posted in News and Information on January 26, 2017 by Terri Merrill. New Organizational Leadership student Jamie McDonald recently shared some words of praise with his recruiter, Patrick Adams. I just submitted my final assignment for the Accelerated Prep Course (two days early). This is going to be fun, man. I just wanted to let you know that the fact that you took time to meet me and sit down and talk with me face-to-face had a lot to do with my decision to go with Bethel. The insight that you were able to give me from the real-life, honest, homegrown-student perspective gave me the confidence to make a go at the online program. With my career requiring me to travel quite a bit and sometimes keep odd hours, I really don’t think that I could commit to physically attending classes with no interruption. I spent over two full months’ time traveling for a week at a time, spread throughout last year. I have been on the road about a month so far this year. I just spent the week before Orientation in Atlanta at a best- practices sharing conference. This entry was posted in News and Information on January 19, 2017 by Terri Merrill. I often hear people express their dream of achieving “perfect work-life balance.” While a wonderful goal, it is nearly impossible to achieve while tackling the multiple responsibilities of home, work, and school that are part of our busy lives. In fact, without focus, assistance, and a clear understanding of what “work-life balance” is, it may actually be beyond our reach most of the time. That doesn’t mean it’s impossible to achieve … but we have to know what it is to embrace it. So what is work-life balance? In my opinion, it is a very rare period during which everything falls into place. You have abundant energy, money, and time to achieve every responsibility and every goal you have in front of you. Put that way, it’s easy to see that work-life balance can be fleeting, elusive, and frustrating – and nearly impossible to maintain. This entry was posted in News and Information on January 12, 2017 by Terri Merrill. On Sept. 11, 2015, Bethel University student Sandra Meshelle “Meesh” Kidd was set to celebrate. Having just left a 15-year career at Life Care Centers of America, she was headed to a weekend retreat in Panama City Beach before the start of a new job in just four days’ time. She was accompanied by some of her favorite people: her mother, her best friend, and her cousin. The four stopped for lunch in Tallahassee, and left the restaurant giggling like schoolgirls. They were headed to the beach — and Meesh was ready to start a new chapter in her life. She couldn’t have foreseen that the “new chapter” would involve a journey through pain and loss. Just hours after leaving the restaurant, Meesh’s car was T-boned by a vehicle going 60 miles an hour. After rolling three times, their car hit a fence post, before finally shuddering to a stop in a cotton field. Her mom, along with her best friend Karen, were killed on impact. Her cousin sustained serious injuries. Meesh herself has no recollection of the crash. “In fact, I have 12 days of memory loss that starts after we ate lunch that day,” she says. This entry was posted in News and Information on January 5, 2017 by Terri Merrill.